I like buying quality merchandise when it is marked down. Investors who closely follow the financial markets discover fairly quickly that the prices of stocks often do not reflect their intrinsic value. For example, during the Financial Crisis, while the economic situation was exceptionally gloomy due to the near-collapse of the global banking system, stocks at the time were undeniably inexpensive relative to their underlying intrinsic value. Indeed, in 2008, we invested in a handful of companies whose share prices reflected market capitalizations that were lower than the value of the cash on their balance sheets; essentially, we were buying these businesses for less than free. Our investment rationale at the time was that, if financial Armageddon did not transpire, the long-term future return of such stocks would likely be very attractive. Equities began to rebound in March 2009 and, since then, have continued rising in price. U.S. stocks especially rebounded, outperforming every other foreign stock market index in the world. Over the past nine years, U.S. stocks have gone from undervalued to fairly-valued to more-than-fairly-valued. Finding attractive stocks to purchase for our clients is always a difficult endeavor. However, since Quantitative Easing began five years ago, undervalued stocks have become even more difficult to find, while overvalued stocks are seemingly everywhere. Ben Graham’s adage, “Price is what you pay; value is what you get,” holds as true in today’s rising market as it did in 2008. When we make capital commitments on your behalf, we know that the price we pay will be the primary determinant of our clients’ long-term investment return. Like the rest of the world, we cannot predict when the current bull market in U.S. stocks will end, but we can comment on the lack of value in today’s market and the effect that overvalued U.S. stocks will have on investors’ long-term investment returns. Our comment is, put simply, that the ten-year future return of broad U.S. stock market indices, such as the S&P 500 Index, will likely be relatively modest. 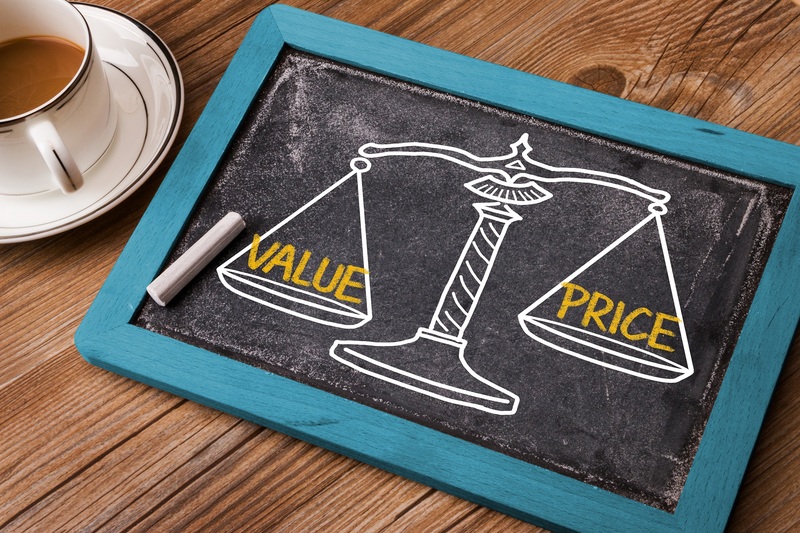 Over the past twenty years, investors have been taught important and costly lessons about the difference between price and value. Because investors tend to forget history lessons in the middle of strong bull markets, we want to set aside a moment to reflect. During the housing bubble, home buyers assumed, wrongly, that strongly rising prices reflected strongly rising values. Home prices surged even though household income and rent prices remained flat. Home price increases were driven by animal spirits, loosening lending standards, and the willful blindness of policymakers and bankers. During the subsequent housing bust, the price/median income and price/rent ratios both came back down to earth as housing prices declined.The banking system, saddled with toxic mortgages, was bailed out at the cost of trillions of dollars of taxpayer money. Many homeowners were not as lucky. Certain families that overpaid for their houses with large mortgages lost their homes. Today, nearly ten years after the housing bubble collapsed, more than 10% of homeowners in our home town of Chicago are still trapped in underwater mortgages. For many homeowners, overpaying for their primary homes destroyed their long-term financial plans. In 2000, large cap growth stocks and dot-com stocks were absurdly overvalued, in our view. At the time, stock prices reflected unjustified and unrealistic optimism about the future growth and profitability of the U.S. economy and the U.S. technology sector. For example, Cisco Systems was the most valuable company in the world during the early 2000s. The company traded at a nosebleed 125x Price/Earnings multiple at the time, and investors were talking about companies like Cisco as “one-decision stocks,” meaning that investors who buy such a blue-chip technology stock do not have to think about it again as the stock continues to rise in price. History has proven that the optimism surrounding Cisco’s share price was unwarranted and, as expectations inevitably came down when technology spending began to cool off, Cisco’s share price plummeted. Today, Cisco shares still trade at less than 50% of the company’s 2000 high. In retrospect, the problem with investing in Cisco in 2000 was not that revenue and earnings growth did not materialize, as the business has performed well since that time. Cisco has generated an enviable five-fold increase in earnings per share since 2000. 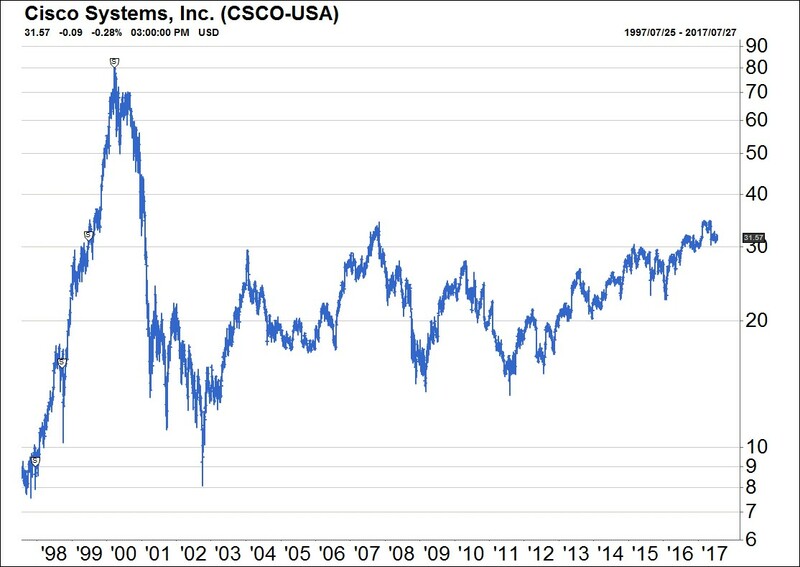 The problem for investors stemmed from the fact that Cisco’s Price/Earnings multiple was simply too elevated in 2000, making it difficult for investors to generate adequate rates of return in the years to come. Because it boasted the highest market capitalization in the United States in 2000, Cisco represented the largest constituent of the S&P 500 Index. Due to the over-valuation of Cisco Systems and other similarly overpriced large cap growth stocks, the S&P 500 Index and the Nasdaq Composite generated a negative investment return during the subsequent decade. We are currently in the ninth year of an incredible, liquidity-driven bull market in financial assets. By now, many investors have forgotten what it feels like to experience a crushing bear market; in fact, nearly one-half of traders on Wall Street have never experienced a recession in their professional careers. Few investors are paying attention to value, but they are paying attention to a handful of technology companies, the so-called “FANG” stocks, which due to their market capitalizations, have had an outsized influence on the returns of the S&P 500 Index. In this respect, the market environment today rhymes with the bull market of the late 1990s. The two charts on the following page are worth examining because they help to explain our somewhat somber view on the prospective 10-year returns for the S&P 500 Index. 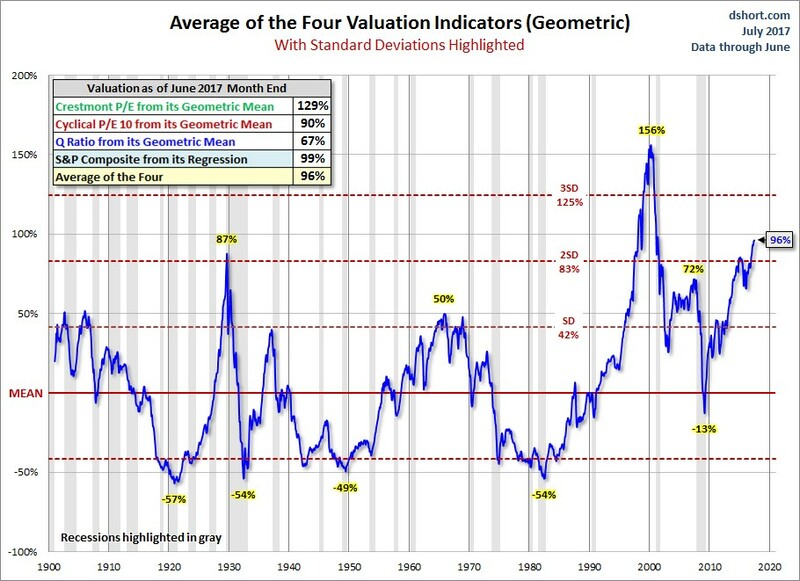 The first chart (“Average of the Four Valuation Indicators”) uses four different valuation metrics to determine the overall “value” of the S&P 500 Index. Depending on the metric used, the stock market is trading at 67% to 129% above fair value. The chart’s plot of the average of these four measures over time illustrates how richly priced the S&P 500 Index is today compared to history. The S&P 500 Index is currently trading at a valuation level that is higher than any other period of the past 100 years except for the 1999-2000 years when the dot-com bubble had not yet burst. The range of historical 10-year forward return figures spans from -4% (in 1929) to +21% (in 1949). Years which began at below-fair-value levels generated extremely attractive 10-year forward returns, while years which began at more expensive valuation levels in the first chart generated much lower 10-year forward returns. 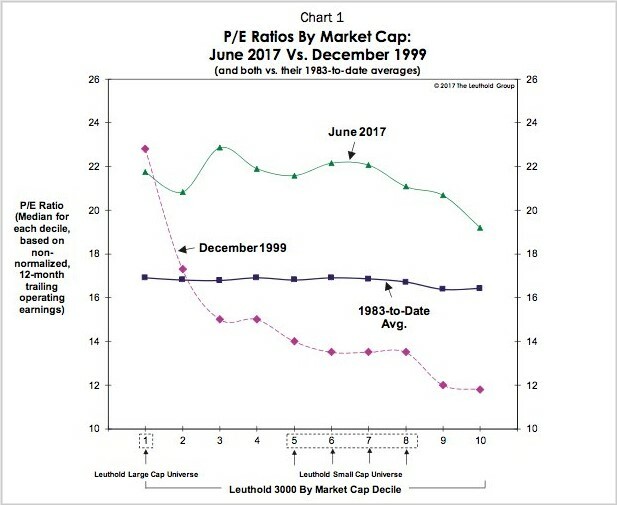 The two peaks in valuation besides the current era, 1929 and 2000, resulted in negative forward returns for stocks during the subsequent ten years. These charts suggest to us that the investment return of owning U.S. stocks during the next decade is likely to be sub-par. Given the inclination of the Federal Reserve to depreciate the dollar, future stock returns may be positive due to inflation, while inflation-adjusted returns from owning stocks in the future are likely to be weak. Central banks: In recent years, certain central banks have turned to printing money (to keep their currency exchange rates low) while, at the same time, buying stocks with that printed money. The Swiss National Bank, for example, owns about $80 billion in U.S. stocks and has invested $17 billion in U.S. stocks in 2017 year-to-date. Unlike private investors, central banks do not make investment decisions to generate economic profits; they make investment decisions to meet monetary policy goals. 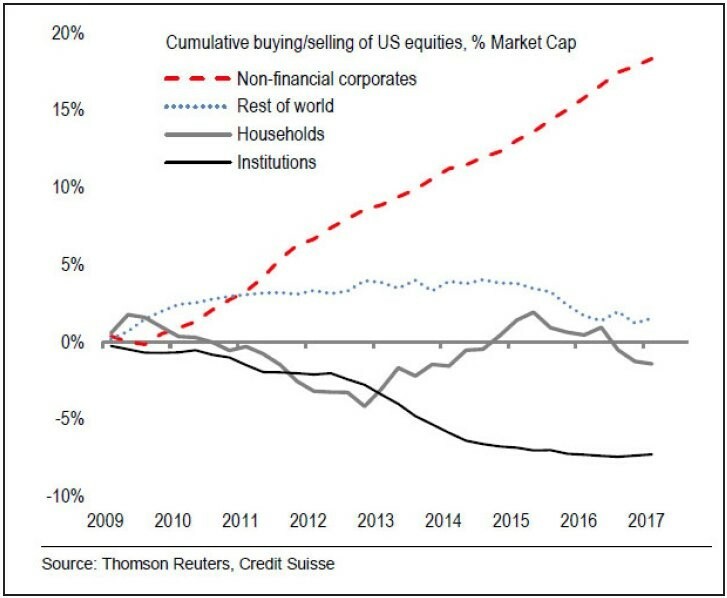 Corporations: Corporations have been taking advantage of the low interest rate environment to issue debt and use the proceeds to buy back shares of their own In the chart to the right, it is clear that the primary buyer of equities since the financial crisis have been corporations. Corporate buyback activity has exceeded $100 billion per quarter over the past several years. Management teams and boards generally make these buyback decisions to maximize the value of their equity grants, stock options, and other forms of equity-linked compensation. Because corporate buybacks are usually driven by management compensation considerations rather than by price/value considerations, corporations should also be categorized as price-insensitive investors. Passive index funds and ETFs: Capital flows into passive index funds and ETFs have increased markedly in recent years. Passive investing is, by definition, price insensitive investing, and capital flows into passive products have greatly increased the level of price insensitive investment activity. Unfortunately, price-insensitive buying can lead to poor capital allocation decisions. Conversely, just as price-insensitive buying can boost the prices of stocks, price-insensitive selling can depress the prices of stocks. When the next market turn occurs at some undetermined point in the future, we fear that such price-insensitive buyers may become sellers, thus potentially exacerbating the next market downturn. In 2000, the overvaluation of the stock market was limited to the overvaluation of dot-com stocks and large cap growth stocks. At the time, it was possible to find undervalued stocks by investing in other areas of the market, such as in value stocks. While large cap stocks in the top decile of size like Cisco were ludicrously priced, in our view, many mid-cap and small-cap stocks offered attractive value (see purple line in the chart below). In comparison, it is more difficult to find a place to hide today because the overvaluation in U.S. stocks is not limited to large cap growth stocks. The green line, marked “June 2017,” shows clearly that U.S. stocks across the market capitalization spectrum appear to be expensive in the current market. Sticking to high quality companies with strong balance sheets and cash flows as well as wide economic moats. Investing selectively in new equity securities that we believe are trading at a discount to our estimation of intrinsic value and where the expected return is far higher than that of the broad market indices. Holding cash and cash equivalents which can be used to purchase stocks when stocks become more attractively priced. Allocating more capital to foreign stocks which are inexpensive relative to U.S. stocks, in our view. Maintaining a meaningful position in precious metals which should appreciate with inflation but are not subject to the overvaluation problem of U.S. stocks. Our goal is not to time the market in any way or to avoid risk altogether, but to invest only where we are paid sufficiently to take risk. We have already mentioned that we have no strong view about when the market will peak, but we do have a strong view that the majority of U.S. stocks are expensively priced. 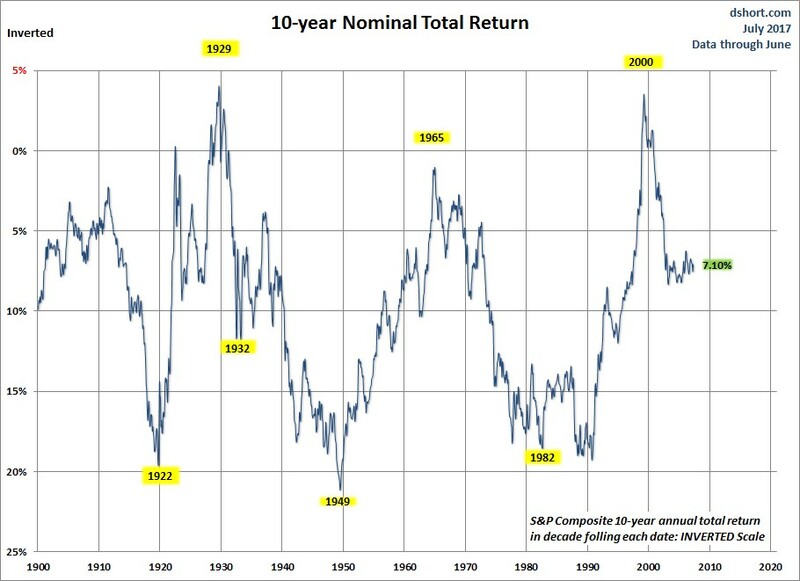 While our focus is on long-term investment returns, we are seeing an increasing number of indicators that we are closer to the end of the current bull market than the beginning: (1) as an example, the Federal Reserve has stopped easing monetary policy and has been tightening monetary policy for several years; (2) the Federal Funds interest rate set by the Federal Reserve continues to rise; and, (3) it appears increasingly likely that Chairperson Janet Yellen, within a matter of months, will begin to reduce the size of the Fed’s balance sheet. Without a monetary policy reversal, we expect tightening liquidity conditions to begin impacting the capital markets. Last year, in our Q2 letter, we discussed the topic of passive investing in detail. Investing involves risk, including loss of principal. There is no guarantee that the strategies discussed in this commentary will succeed. Small and mid-cap investing involve greater risk not associated with investing in more established companies, such as greater price volatility, business risk, less liquidity and increased competitive threat. Investment in international markets present special risks including currency fluctuation, the potential for diplomatic and political instability, regulator and liquidity risks, foreign taxation and difference in auditing and other financial standards. Fixed income investments are affected by overall market movements, changes in interest rates, and other factors such as weather, disease, embargoes and international economic and political developments. Investments in commodities such as gold may be affected by overall market movements, changes in interest rates, and other factors such as embargoes and international economic and political developments. Commodities are assets that have tangible properties, such as oil, metals, and agricultural products. These instruments may subject investment strategies to greater volatility than investments in traditional securities.